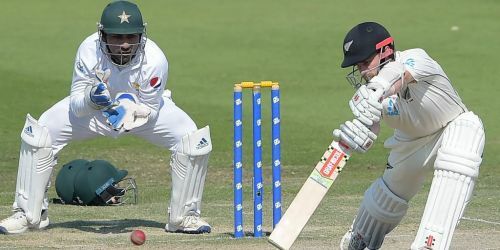 New Zealand showed tremendous grit to defeat Pakistan by 123 runs in the third Test match at Sheikh Zayed Stadium in Abu Dhabi. It was an amazing performance by the Kiwis who showed great skills after conceding a lead of 74 runs in first innings. Kane Williamson and Henry Nicholls stitched a marathon partnership to ensure that New Zealand had enough runs to declare on the fifth day morning. The 123-run win led them to an away Test series victory against Pakistan after 49 years. New Zealand captain Kane Williamson won the toss and decided to bat first. It was not a great start by the Kiwis who lost 4 early wickets for 72 runs. The skipper led from the front by scoring 89 runs. BJ Watling and Williamson added 104 runs for the 5th wicket before Pakistan bowlers made a strong comeback by picking quick wickets. The visitors ended the first day at 229 for 7. On the second day morning, Pakistan bowled out New Zealand for 274 runs in their first innings. Upon losing Mohammad Hafeez and Imam-ul- Haq, Haris Sohail and Azhar Ali added 68 runs for the third wicket. At the end of day two, Pakistan scored 139 for 3. Azhar Ali and Asad Shafiq batted splendidly to apply pressure on the New Zealand bowlers. Both batsmen scored centuries to lead Pakistan to a strong position. From 286 for 3, they slipped badly and lost their last seven wickets for just 62 runs. New Zealand ended the third day at 26 for 2. New Zealand were reduced to 60 for 4 during the fourth day. Williamson and Nicholls put on a special partnership to ending the fourth day at 272 for 4. They added 212 runs for the fifth wicket. On the final day, New Zealand scored 81 runs in 9 overs and declared their innings at 335 for 7. Chasing a target of 280 runs to win, Pakistan lost wickets at regular intervals and were eventually bowled out for 156. The Kiwis rode on a stellar bowling performance to register the series-clinching victory. Brief Scores: New Zealand - 274 all out in 116.1 overs (Kane Williamson 89, BJ Watling 77*, Bilal Asif 5/65) & 335/7 declared in 113 overs (Williamson 139, Henry Nicholls 126*, Yasir Shah 4/129) beat Pakistan - 348 in 135 overs (Azhar Ali 134, Asad Shafiq 104, William Somerville 4/75) & 156 in 56.1 overs (Babar Azam 51, Ajaz Patel 3/42, Tim Southee 3/42, Somerville 3/52) by 123 runs.